Reviews | Choice Insulated Food Delivery Bag / Pan Carrier, Green Nylon, 23" x 13" x 15"
Control food temperature during your restaurant's delivery service or transportation to catered events with this Choice green nylon insulated food delivery bag / pan carrier! This carrier's 1/2" thick layer of insulation keeps warmed foods piping hot and cold foods chilled. The zipper top enables easy opening and secure closing. Plus, the container's top load design creates a broad area for quick loading and unloading of containers. Each carrier can hold up to five full-sized 2 1/2" deep food pans, as well as a combination of different fractional-sized take out containers. There's even room for hot or cold packs too! Amazing product, we use them daily for catering, we have different colors so we are able to keep in line the different orders. They are very easy to use and do the trick! This is a great price for these very useful delivery bags. We go through a lot of these at our business and really can't recommend these enough. This bag is ok. I've had it this for awhile now. I also have this in red. I wish it was more sturdy so that the bag doesn't sink in when there's food inside. This bag works great. We use it to transport cold products from store to store. It helps keep the product at the right temperature while in transport. This food pan carrier/delivery bag has been a real workhorse for us. 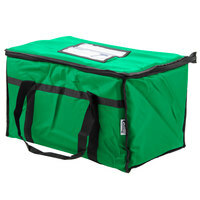 Green bag for cold catering items. Zippers, handles and Velcro all have held up well. When washing, we pin the layers of fabric and foam together on all sides so the foam doesn’t shift during the laundering process. Yes, we throw it in the washer on delicate cycle when it needs more than a spot cleaning! These bags worked great the first few times I used them, I purchased six of them for transporting my product to events. Unfortunately many of the zippers have broken and some of the interior lining has torn. The price point is great, they just don't last as long as one would expect. Unfortunately customer service has said there is no warranty for this item. We love transporting in this thermal bag. It’s a perfect fit for chafing pans as well as aluminum pans and take out containers. We also use it for smaller catering deliveries where A Cambro would be too cumbersome. I was initially satisfied with these bags. However, less than 5 months in use the bags have not held up to my expectations. The zippers are poor quality stitching and have frayed. The inside fabric lining of the bags has also been pinched and punctured by the edges of disposable catering pans. The velcro wraps on the handles also have poor quality stitching and have not withstood basic wear and tear. I would not purchase these bags again, and would not recommend that someone looking for a durable catering bag for even moderately busy catering company purchase these bags. My advice would be to order the next step up in hopes that the handles and zippers will at least hold up for 6 months. We are sorry these bags did not hold up for you, a Customer Service Representative will be in contact with you shortly! I used this carrier at an event last weekend. I put 3 of the Sample and Display Tray Kit with Black Polycarbonate Tray and Hinged Cover 214PKITHNGBK - EA in it and it worked awesome to transport them safely with a perfect fit. I'm going to order more of this bag today! Light weight and Durable. i didnt know what to expect when I got it on sale, but it held its temp and is well constructed. I bought 5 of them for the Food Network Rooftop Chopped event in NYC I was invited to compete and we had 5 full size pans inside each carrier. Great buy. This product performs as expected, but the stiching sometimes needs reinforcement. The fabric on this one is more rugged than the smooth nylon provided with other colors. This is a wonderful bag. It holds my Full Trays of hot and cold foods. I also use this with my 24 cavity cupcake holders I ordered here! Great value and sturdy! Love this bag. Very sturdy, and insulated. I carry very heavy products on deliveries and this bag holds up really well. I like that it has a place for a pack slip or paper The only downside is that there is no shoulder strap. So when carrying a heavy bag it can be difficult. These coolers are working perfectly for us! We make smoothies and we carry the smoothies in crates. The great thing about these coolers is that the crates with the smoothies fit right into the coolers, then we just zip them up! We are loving having them. this was a nice bag until the zippers broke. We are on our 4th bag, the first two bags broke very quick. The two newer bags have held up better. The zipper functions, but the actually grip on the zipper handle is broken. The Choice 23" x 13" x 15" Green Insulated Nylon Food Delivery Bag / Pan Carrier is just what we needed for our booming delivery service! Thank you for the feedback, Michael. We're sorry these bags started to rip at the zippers. A Customer Solutions Representative will reach out to you shortly. I have bought a number of these bags and it seems the quality keeps decreasing. They are much less "insulated" this time around, and the fabric seems very thin. I do like that they added the view pocket where you can place an invoice or note, but the bags don't hold food for as long as they used to. Thanks for reviewing these delivery bags, Leah! We're sorry these did not work for you. A Customer Solutions Representative will contact you soon. The bag is nice and the quality felt good. I was disappointed to find how large the bag was though. Next time I will order a smaller size. Love this bag. Great size fir all our shipping needs. Bought one for my son too. We use these for our weekly grocery shopping. And its easy to fold down to store. Excellent value as it is very well made. Really love this Insulated Food Bag. Bought it especially for my car. it comes in so handy when I'm grocery shopping. Bringing home refrigerated/frozen items knowing that they're still cold, safe and sound until it reaches my house. I also love it for carrying home my take-out food-keeps everything so nice and hot. Bag itself is very sturdy, holds a lot and keeps accurate temperature of my food. The only complaint that i do have is that around the zipper the material gets frayed-so sometimes it is a bit harder to zip as it gets caught. But never had it get so caught that it wouldn't work-just a few extra tries is all that's needed. But all in all-how did I get along without this before! I love this green nylon delivery bag because green is my company color. As a personal chef I purchase lots of groceries, the green bag I use for vegetables. It is very big, fits about 4 bags of groceries filled to the top with vegetables. It is well made, it can be cleaned with a wash cloth and its stands sturdy. Also the handles are very convenient. We use these carriers when we deliver meals to the homeless in our area. They keep the meals warm or cold depending on what type of meal we deliver. They are large enough to fit 10 strofoam container. For storage purposes you can fold them up and store inside of one another. Quality of the bag is great. Great heat retention and space saver. Lightweight and convenient for small jobs especially when you don't want to slug around the heavy catering cambro. Food stayed HOT in 3 hour traffic. Very professional looking. I wrapped my aluminum pans with saran wrap for spillage and lined the bag with thin cake boards. I have truly been enjoying my insulated nylon food delivery bags... They are so flexible and easy to store. I have primarily used them for delivering my weekly meals to my clients. It has kept my product temperature maintained during travel and the time I had a minor spill of product it had no leakage or draining from the bag.. Quite sturdy. The only small issue I had with the bag is the zipper tends to get stuck at times when going around the corner. Other than that I love this bag.. I love the vibrant colors and the ease of transport.. I purchased this bag for a friend, she loves it! I knew she would. I have 8 of them and I love them so much! this item has worked very well. The exception is all the little threads that get caught in the zipper. You can burn them off with a lighter to make it a smooth zip. we are placing a reorder for this product. It fits a need for our many small satellite sites. Some rigid foam and solid plastic are very durable, but too heavy. These are very light, and of course will not be as durable, but if we have to replace them yearly it's better and cheaper than a back injury. Perfect for delivering food. These really keep the food warm and take up so much less space than hard sided carriers. Very sturdy construction and easy to clean if you have spills. Much bigger than expected. Can hold quite a lot of delivery food. Excellent at keeping food at the temp it went into the bag at, even for a good amount of time afterwards. These bags do what we need them to do. They are perfect for 1/2 size foil sheet pans. They also clean up easily and keep food hot!! !